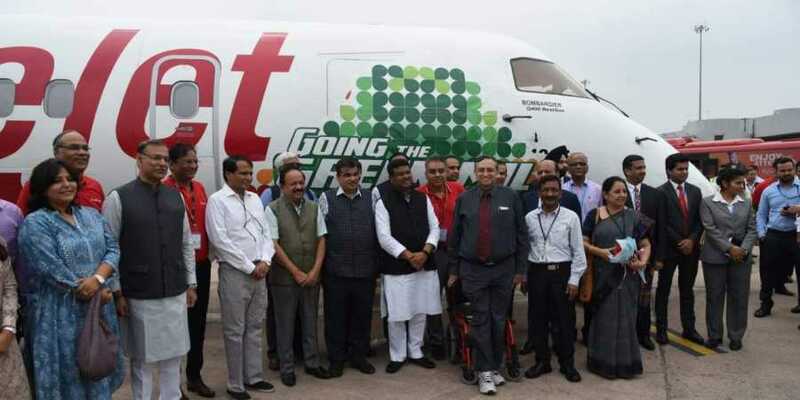 SpiceJet on Monday flew the country’s first biofuel-powered flight, which took off from Dehradun for Delhi this morning. Around 20 people, including officials from aviation regulator DGCA and SpiceJet, were in the test flight. According to sources, the low-budget carrier used a concoction of 75 per cent of bio-fuel and 25 per cent of turbine fuel to power SpiceJet’s Q400 turboprop flight. The fuel, made from Jatropha crop, has been developed by Indian Institute of Petroleum, based in Uttarakhand’s Dehradun. Biofuel flights make air travel cleaner and more efficient by reducing carbon emissions, thereby also marking a huge reduction in the cost of airline operations. Around 20 people, including officials from aviation regulator DGCA and SpiceJet, were in the 78-seater aircraft. The duration of the test flight was around 25 minutes, according to an airline executive. Union Petroleum Minister Dharmendra Pradhan, who was present at the Delhi airport, called the flight a “big achievement in the aviation sector.” “On 10th August, PM Modi announced the new biofuel policy and today we have successfully implemented it in the aviation sector. It’s a big achievement in aviation and clean energy sector. GST has been decreased on Biodiesel and ethanol,” he said, reported the media. The biojet fuel has been recognised by American Standard Testing Method (ASTM) and meets the specification standards of Pratt & Whitney and Bombardier for commercial application in aircraft. The development assumes significance as high air turbine fuel (ATF) prices have dented India’s domestic airline sector with all the major players reporting losses for the first quarter of 2018-19. SpiceJet Chairman and Managing Director Ajay Singh said biojet fuel is low cost and helps in significantly reducing carbon emissions. “It has the potential to reduce our dependence on traditional aviation fuel by up to 50 per cent on every flight and bring down fares,” he said.